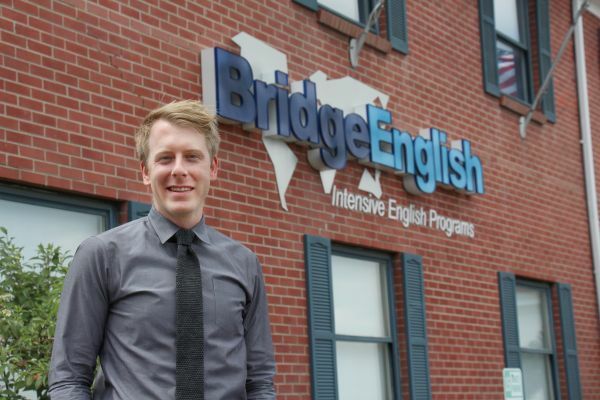 If you attend classes at BridgeEnglish Denver, you will get to know Nick Martin. Nick has many roles at BridgeEnglish Denver and he works very hard to make sure that students are well taken care of. We asked Nick some questions about his background, his advice, and things that you probably wouldn’t ever know about him unless you asked – meet Nick! I am the Student Services Coordinator; in conjunction with teaching in the General English Program, I also assist the students with any needs they have related to their studies here at Bridge. This includes student advising, new student processing, orientation, and anything else that ensures the students have not only a smooth, but also a wonderful time during their programs. I also retain many of my duties from my previous position as GEP Lead Teacher. Duties such as program and curriculum development, program and materials maintenance, teacher training, and anything else that helps keep the GEP running efficiently and effectively. I’d have to say that never before have I had the opportunity to expand my skill set and really apply my creativity in a job as I have with Bridge. Many opportunities have become available to me here that I’ve been able to put my creativity towards. Get serious–university is nothing to be taken lightly. And do your research on where you want to go. This is just as true for international students as it is for American ones. Also, write! Write in English as much as you can. Not only will this improve your language abilities in unforeseen ways, but it will help to get you acclimated to the academic experience you can expect at a university. One of my favorite stories is that of a previous student, Nassar Alharshan. It is a story of amazing success. I remember when he first came to Bridge, he started in an A2 class. His English was incredibly low. He could barely form a sentence. Through incredible dedication to his studies, and indomitable perseverance, he was able to rapidly improve his abilities to a degree that was mind-blowing, and inspiring. I remain friends with Nassar as he’s continued his studies in California, and his English is approaching mastery level that few have managed to achieve. He is living proof that hard work pays off. That’s a really difficult question to answer since I have been living here my entire life. My first answer would probably the wide variety of beer available. Being an enormous fan of craft brews, Denver never fails to fall short of my expectations. After that, I would suppose I enjoy how Denver is able to offer so much culturally while still maintaining its smaller city charm and appeal. I always feel cozy in this town but also like there’s always more to discover and do. I also enjoy the weather, despite our recent nearly month-long inundation. What is one thing about you that students don’t know? Students are probably not aware of the degree to which I obsess over anything space related. Whether it’s fact or fiction, I love outer space and anything involving it. I’m captivated by satellite imagery of Mars, and equally enthralled by tales of galactic adventure. If anyone ever wants to talk space, you’ll find me to be a welcome conversation partner. esl-blog, Meet our staff! Bridge English, Denver, english teacher, ESL teacher, Interview, Teacher. permalink.